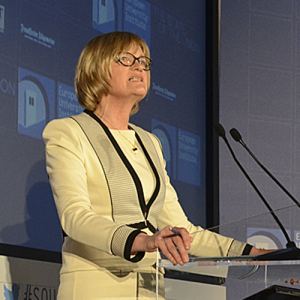 Brigid Laffan is Director of the Robert Schuman Centre for Advanced Studies, and Director of the EUI’s Global Governance Programme. Women may hold up half the sky but they hold up barely a ceiling tile when it comes to the FTSE 100’s boardrooms. Less than one in 10 executive directors at Britain’s top companies is a woman, research has revealed, and the situation is even bleaker in Germany and France. In Europe’s top 100 companies, men hold 89% of executive committee jobs while women hold 6% of staff roles. So what can be done to address this imbalance? Professor Brigid Laffan, Director of the Robert Schuman Centre for Advanced Studies (RSCAS) and Director of the Global Governance Programme at the European University Institute (EUI) believes that mandatory quotas are an important tool in addressing the most egregious gender disparities, at least in the short term. In many ways, Laffan’s sentiments more generally reflect some of the changes that have taken place in the priorities of the feminist movement since the 1970s. Though never a homogenous movement, the efforts of second wave feminists were propelled largely by a radical ideological critique of existing gender and economic paradigms. A force that was marginal and countercultural, the call for gender equality has now become normalised and institutionalised. Indeed in recent years, western societies have seen the rise of ‘corporate feminism’ which stresses women’s assimilation into the institutions once considered central to their oppression, epitomised in Sheryl Sandberg’s ‘Lean-In’ philosophy. A Chief Operating Officer of Facebook, Sandberg has drawn criticism from some feminists for claiming in her 2013 book Lean In: Women, Work, and the Will to Lead, that the gender gap in part owes itself to women holding themselves back from leadership roles through their own socialised behaviour. But more fundamentally, many point out that contrary to Sandberg’s starting premise, securing gains for women in the corporate elite does not necessarily translate into gains for women as a whole. So how far do we actually need a radical reshaping of our current economic structures in order to truly advance’s women’s rights? It remains clear that although women are still underrepresented in the world’s corporate elite, change is slowly underway. Given the immense shifts noticeable over even a single generation, there is ample reason to remain optimistic that gender parity in the world’s leading institutions will be imminently realised.